View of the Pen-y-lan estate near the River Dee in the parish of Roath in Wales. 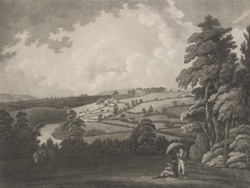 The house that can be seen in the background of this print was probably built in c.1690 on the site of a smaller farmhouse by Ellis Lloyd whose wife had inherited the land. The River Dee can be seen flowing through the estate below the house. The river is over 70 miles long, rising in the hills above Llanuwchilyn flowing to its estuary on the North Wales coast.